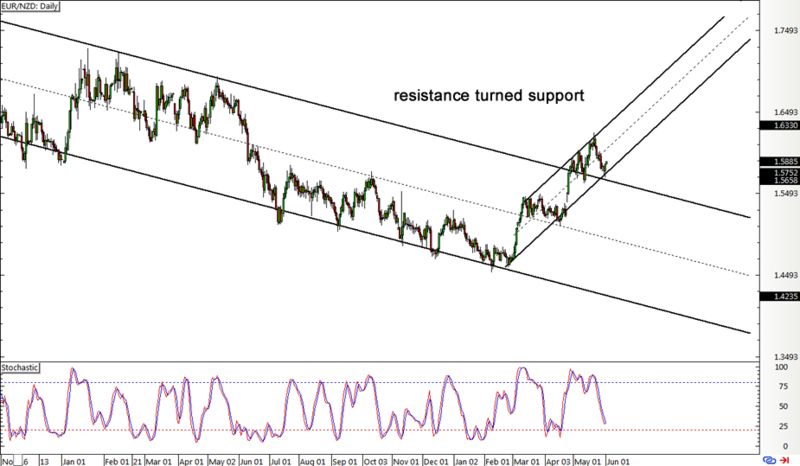 After breaking out of its long-term downtrend channel, EUR/NZD has started a new uptrend and is finding support at a smaller rising channel. Here’s why I hopped in at market. This pair had been trading inside a descending channel pattern for years already but just recently broke past the resistance to signal that it’s done with the selloff. From there, a new ascending channel formation can be seen, with the bottom coinciding with the broken longer-term resistance. Zooming in to the 1-hour time frame, I noticed that price already bounced off the channel support around the 1.5750 minor psychological mark. This could mean that the pair is ready to resume its climb back to the resistance around the 1.6500 levels. 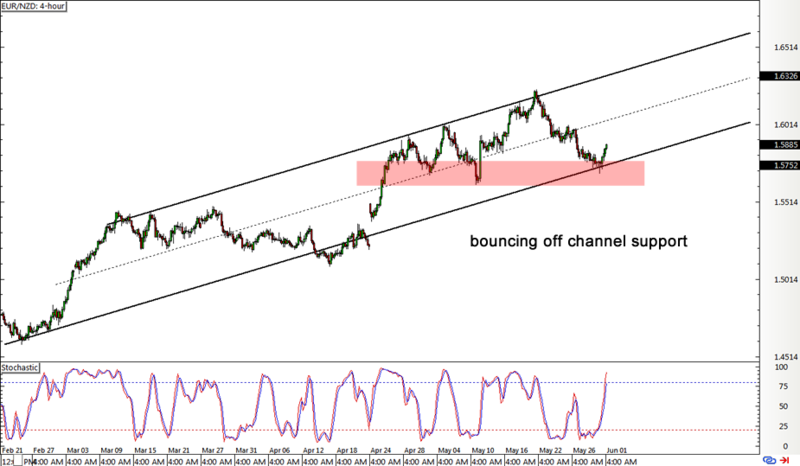 At the same time, stochastic is moving north so EUR/NZD could be headed in the same direction. However, if sellers take over, a break below support around 1.5700 might be a sign to hop out of this long position. I’m bullish on the euro because the region has been showing improving fundamentals for the past couple of months. Of course there have been road bumps here and there, such as the flash CPI miss, but more green shoots are popping up these days. I’m a bit worried about the resurfacing Greek debt issues and the Italian banking crisis, but the euro zone has been able to move past these hurdles in the past and can do so again. As for the Kiwi, it looks like risk aversion stemming from the dismal Chinese Caixin manufacturing PMI is dampening the comdolls gains. Long EUR/NZD at market (1.5875), stop loss at 1.5575, initial profit target at 1.6475. I’ve risked 0.5% of my account on this position for a potential 2:1 return-on-risk. So much for that confluence on EUR/NZD! Rumors of the ECB cutting its inflation outlook weighed heavily on this pair and caused a breakdown.